A signature design from the LoveUrns® Collection, the Soul Bird Female Hand Hammered Alloy Urn stands out for its innovative bird shape and its intentional design to be displayed with its companion urn. The Soul Bird Urn is finished in shining charcoal gray and silver, and features attractive hammered metal elements to create the overall shape of the bird. 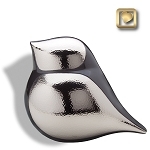 This lovely female bird can be displayed side-by-side with its partner, the Soul Bird Male Hand Hammered Alloy Urn, as a loving tribute to a cherished couple. This brass urn has both smooth and hammered elements, adding a lovely contrast of textures which define the bird's face and wings. Birds are commonly associated with peace, the soul, and companionship. This may bring you comfort as you reflect upon the life of a loved one. 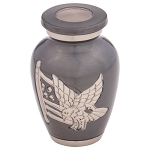 The unique Midnight finish on this LoveUrns cremation urn is not a traditional black. Rather, it is a charcoal gray color with a shining metallic finish. 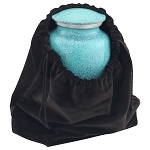 The Soul Bird Female Hand Hammered Alloy Urn comes with a velvet urn storage bag, which can be closed via a gold tasseled rope. 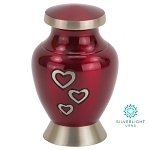 Due to the special LoveUrns™ Glosscoat Anti-Tarnish Finish, this urn cannot be directly engraved. The LoveUrns™ Collection is a premier line of metal and brass cremation urns, crafted to the highest of standards. Look for the holographic seal to know that you have an authentic LoveUrns™ product. The Soul Bird Female Hand Hammered Alloy Urn is a charming cremation urn for ashes. 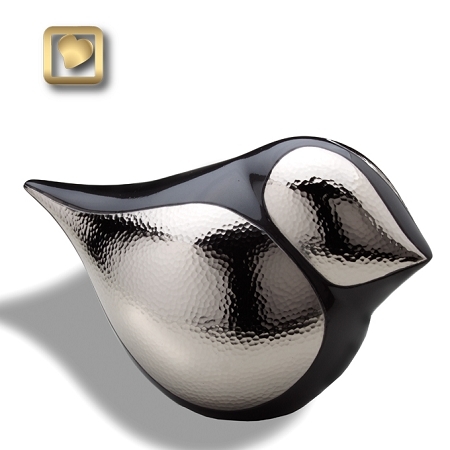 This bird-shaped vessel features unique hammered elements in a striking silver finish.